alpineHEALTH naturopathic doctors are licensed naturopaths (ND's, Naturopathic Docotors) trained in conventional fields and the naturopathic field of diagnosis and treatment. Our comprehensive approach to health care is especially tailored to deal with chronic disease and challenging health problems. Naturopathic medicine is not focused on “symptom management", rather it focused on you the patient - restoring your health and vitality. The scope of illnesses treated by our clinicians are limitless (see Conditions Treated). We realize the importance of providing patients the information they need to fully participate in their treatment. Informed patients are smart patients. Our naturopathic doctors are dedicated to using a combination of both allopathic science and naturopathic methods, to provide our patients with the best medicine has to offer. alpineHEALTH clinicians are licensed naturopathic doctors (ND). All of of our doctors have attended a four-year graduate level naturopathic medical school and are educated in all of the same basic sciences as an MD. 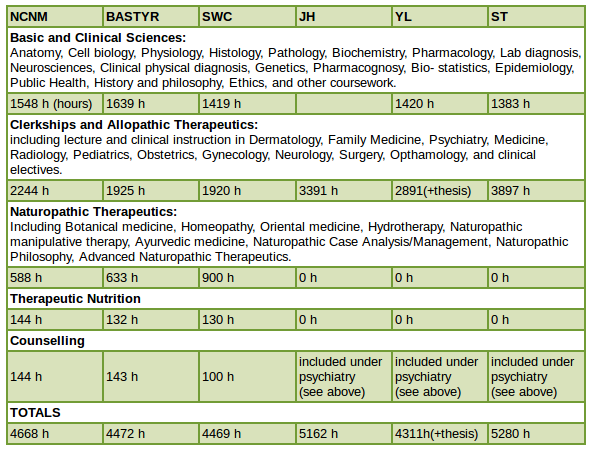 In addition to a standard medical curriculum, the naturopathic doctor is required to complete four years of training in clinical nutrition, oriental medicine, homeopathic medicine, botanical medicine, psychology, and counseling (to encourage people to make lifestyle changes in support of their personal health). As naturopathic clinicians, our doctors have all taken rigorous professional board exams so that he or she may be licensed by a province (Canada), state (U.S.), or other jurisdiction as a primary care clinicians. Our training is so extensive that in many states such as Oregon and Washington, ND's function as primary care doctors. In Alberta our doctors are licensed members of the College of Naturopathic Doctors of Alberta.